The kits are growing fast, both in size and confidence, and are now bouncing up to the big cats and saying “hello!”. As yet, the big cats are unimpressed, and yet we see some signs of – if not actual mellowing – then tolerance. Already their individual characters are coming out. Polly is already a catten rather than kitten. She’s remarkably fast to catch flying feathers onnastick, and grumbles in a charming way if anyone goes near her food. In fact, poor old Mussum got a thwack on the nose the other day when he dared to try to eat *his own breakfast*. She reminds us in many ways of our much lamented Moo, a stripy Bengal, who used charm in a sort of thermonuclear way, but had disturbing fishwife tendencies as well. Sybil (or Squib(ble) as we generally call her) is smaller, and likes to carry things about. She has discovered three of the glittery sponge balls that Ron used to love – deity knows where – and kills them deader at regular opportunities, and then carries them about while chirping rather sweetly. But she’s deadly too. We had a party in the house at the weekend, and both of the kittens were out and about being admired; we could just pick one up and hand her to someone. Kittens kept purring and handees went “Aw …”. And when my grandson met them for the first time (he had no idea they were here) his face was priceless. We really should have set up a video camera. 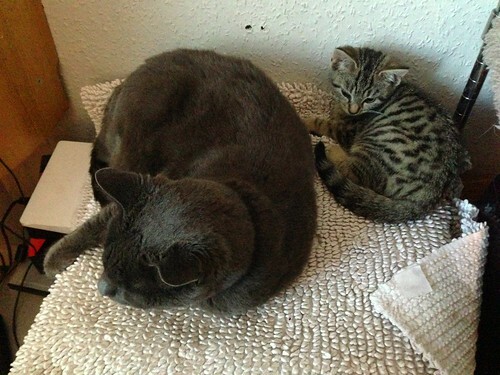 They went to see Sarah the vet yesterday for their checkup and first jab. They were as good as gold, but Polly had a bit of a reaction; she’s off her food a bit, and was very quiet indeed last night. Seems to be recovering now, but it gave us a bit of a fright; we’ve never had any of the Tribe react to a vaccination before. So we shall put off applying the flea treatment till tomorrow I think.